The general cargo ship Kumar started getting water ingress and grounded off Revdanda, India. The vessel, which is loaded with iron ore, lost propulsion power and had to anchor off Revdanda, but suffered cracks in the hull and started sinking. The fore section started leaking and vessel sank in shallow waters, touching the bottom and partially remain above the water. The onboard pumps were unable to de-water the vessel and crew sent distress signal to the local authorities and Indian Coast Guard. At the scene of the accident were dispatched salvage teams and additional pumps to refloat the ship. 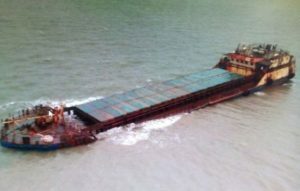 Later the situation with general cargo ship Kumar was returned to normal after pumping out the water and patching the holes. The vessel was towed to Mumbai for repairs and special survey. The local authorities started investigation for the root cause of the accident. Fortunately there were no injured people, but small quantity of oil spilled into the water and cause water pollution. The general cargo ship Kumar (IMO: 9084621) has overall length of 82.00 m, moulded beam of 14.00 m and maximum draft of 4.50 m. The vessel has deadweight of 2,870 DWT and gross tonnage of 1,874 GRT. The cargo vessel was built in 1994 by ABG Surat Shipyard in India. The owner and operator of the general cargo ship Kumar is local company Wespun Maxsteel.